The one motto I have always held about Beauty is that it comes from within. What you put in your body is as important as what you put on your body! Every single small step you can take to lead a healthier lifestyle will pay great dividends. However, me giving up fried foods completely is probably near impossible, but I may just be one step closer to make my favorite fried foods just a little bit 'better' for me. The Philips Air Fryer utilizes Rapid Air Technology to allow you to fry, bake, roast and grill with a tablespoon or less of oil, allowing you to eat healthier without giving up the taste and texture of your favorite foods! Ƹ̵̡Ӝ̵̨̄Ʒ - Cord Storage - Cord Hides Away! Ƹ̵̡Ӝ̵̨̄Ʒ - Restaurant quality fries and onion rings without an oily mess or smelly kitchen! SCORE! Ƹ̵̡Ӝ̵̨̄Ʒ - Easy to use, load the basket and turn it on! Ƹ̵̡Ӝ̵̨̄Ʒ - This is not an accelerated cooking device, it cuts the time to cook most favorites, but if you have a larger family or are cooking for a party you'll need to cook in batches. Ƹ̵̡Ӝ̵̨̄Ʒ - Temperature Dial is a bit tricky as it is divided by odd numbers, it has hash marks for 360 degrees, 390 degrees (etc) as opposed to the 325, 350, 400 marks that most ovens have. A Digital Temperature Setting probably would have made more sense. Ƹ̵̡Ӝ̵̨̄Ʒ - No timer built it, while it does 'ding' when the food is done, some items need to be 'shook' at the halfway mark in the cooking process. Ƹ̵̡Ӝ̵̨̄Ʒ - Chicken skin can stick to it making it hard to clean, a bit of pam should help and I have read other reviews saying to line it in aluminum foil on the bottom like a regular pan, but I haven't tried that yet. I also find Chicken took a bit more time to cook than the manual advised, but that could be because of the amount of pieces I used. Like anything there is an adjustment period to get the timing just right. Ƹ̵̡Ӝ̵̨̄Ʒ - If you start to notice a build up of grease around the fan, you can put 3 cups of water in the bottom and then heat the unit to approximately 390 degrees for about 20 minutes. That will heat the fresh grease around the fan and then it will just drip into the heated water for easy clean up! Ƹ̵̡Ӝ̵̨̄Ʒ - While it does have 'non-slip' feet, it should be used on heat resistant surfaces. Do not set it directly on high gloss granite. As a single gal with no kiddos this unit is definitely handy for me, as I rarely cook in large batches anyway! I like having cheese fries on demand! (Take that certain favorite fast food joint that sells cheese fries, I don't need you anymore!!!) You guys also know I am obsessed with SeaPak Spring Rolls and those Spring Rolls and this Air Fryer are certainly a match made in heaven! I will say that finding dedicated counter space is a challenge so I'll have to store it and lug it out when I need it. I'd say this unit gets four out of five butterflies from me with only minor 'wish list' items to have given it a total perfect score like a bigger basket, digital temp settings, a non-stick base would have been great, and a built in timer. What recipe would you make first with the Philips Air Fryer Butterfly? FTC Disclosure: Affiliate links are used (so please shop away!). 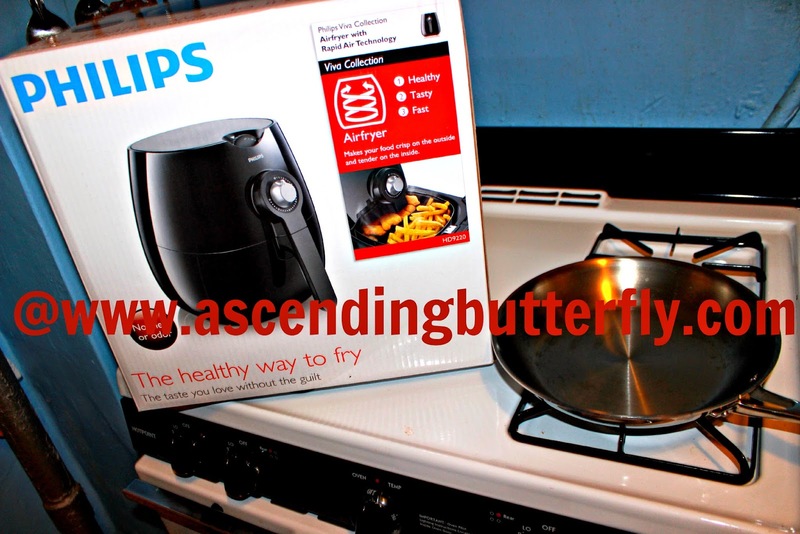 I was provided with a Philips Air Fryer by Best Buy to facilitate my review. All opinions are expressly my own. I am disclosing this in accordance with the Federal Trade Commission 16 CFR, Part 255 - Guides Concerning the use of endorsements and testimonials in advertising, you may visit our full giveaway and disclosure page for complete policy information. I like what you made, I have never had a fryer. want to make with the Philips Air Fryer , hope it works as well ! @Big Happy Buddha - Great point! Especially in summer who wants to heat up the whole kitchen right? That is pretty awesome. I would use that all the time if I had one. @Masshole Mommy - I hear ya! I'm sure with little ones you would rather making 'fried foods' a bit healthier! I've never heard of an airfryer, that is really interesting. I'd imagine a much more pleasant meal. @Nina Say - I love that it's an easy way to make a simple lifestyle change toward healthier eating! This looks like a great product, I had not heard of it before today. I love fried food and this seems like a healthier way to cook. This looks so cool! I'd love to try it! This looks like something I could really use. I have not heard of it before, so I appreciate the share! I would like to see how this would work on the fried foods we currently make. I agree that it's bulky and heavy, but it cooks up frieds perfectly, every time. I didn't know about adding water to take care of these grease. Thanks for letting me know about that. This is awesome! I've never heard of an airfryer before, but I love the idea. I never get to enjoy fried food anymore, because of all the oil. This does away with that. I never knew about this appliance. Although I don't eat fried foods, it looks pretty cool. This is by far the best review of this Philips air fryer. I had no clue it was as big as it is. Thank you for pointing out the good and bad. I don't know what is make 1st. This sounds like a really interesting concept. The only thing that worries me is the size and weight. I don't have a lot of counter space. Wow. This does sound interesting. Will have to check it out. I've heard really great things about these fryers. I may have to check one out soon. I have never seen this... I so want to try this out! I love my Philips Air Fryer , Funny that's what I made first chicken that yummy and I didn't have to add oil NICE! I also made French fries and they came out crunchy so i'm very happy with it And your right it didn't heat up my kitchen !! Love it ! This is such a fascinating machine. It's hard to believe it works! I've never heard of this but it seems pretty cool! Would love to try this out! This looks like a great holiday gift for my daughter. Perfect for her busy life style! This sounds really neat. I've had a fry daddy before but this sounds so much healthier. I think I'd like to try the chicken but also see how french fries tasted on it and maybe even do some sweet potato fries. I debated about putting this on my Christmas list after seeing all the reviews about it. I think it is a much healthier option that other food prep methods and so much easier (especially in summer) than heating up the oven. That looks like a super cool tool! Thanks for sharing! This air fryer looks AWESOME. I would love to have one of these in my kitchen! 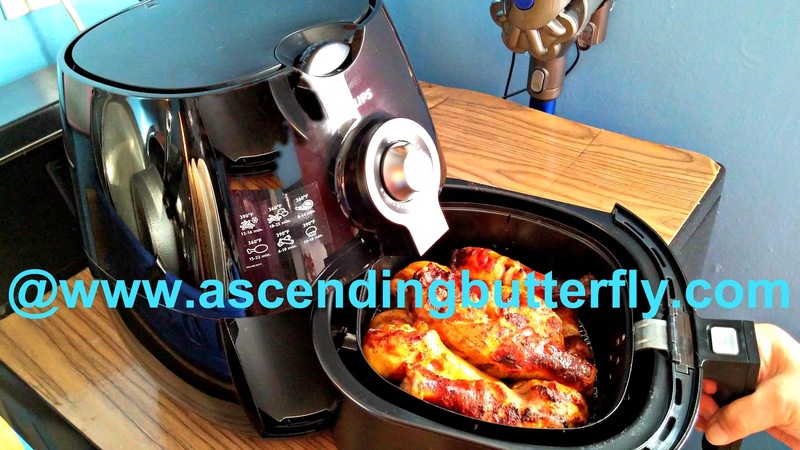 I've had my eye on this Air Fryer for a while now. I have to get one. It's such a good alternative when it comes to preparing food. Frying food is so bad for you. Thanks for sharing your thoughts. Oh wow that works really great!!! YUM!